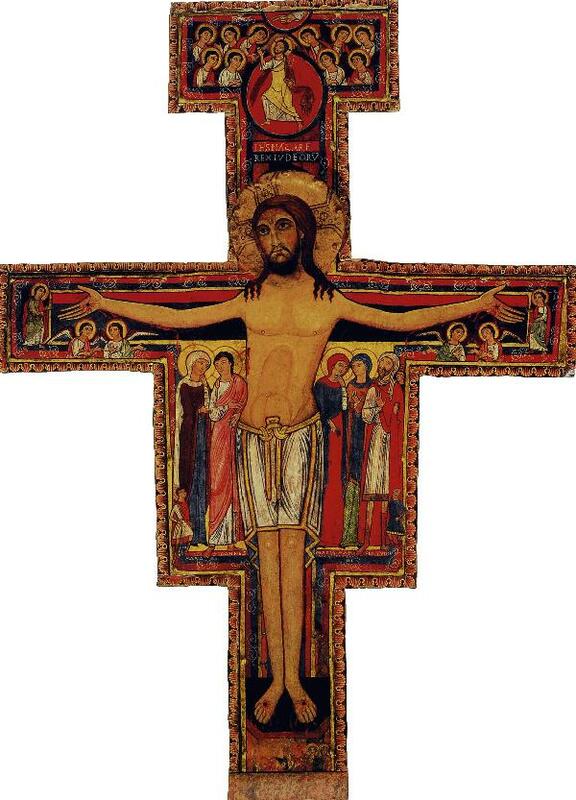 National Fraternity of the Secular Franciscan Order in the United States October 4, 2014: The Blessed Feast Day of "Our Holy Father, Francis of Assisi, Deacon, Founder of the Three Orders"
May the Lord give us Peace! "Most High, glorious God, enlighten the darkness of my heart and give me true faith, certain hope, and perfect charity, sense and knowledge, Lord, that I may carry out Your holy and true command." We pray in Jesus' name. Thus, as I did last year, the organizing principle for this Annual Report will be these six priorities set by the National Fraternity to build Fraternity: Spiritual Assistance, Formation, Youth, Outreach/JPIC, Communication and Vocations. In addition, the 2013 National Chapter chose "by acclaim" (according to the Minutes, line 627) as the theme for this year: "Be the Merciful Presence of God," so that these priorities on building fraternity should also keep the virtue of Mercy front and center. In other words, it is not only WHAT we are doing, for example, Spiritual Assistance or JPIC, but also HOW we are doing it, prayerfully, with Mercy. Why the consistent focus on Fraternity? First and foremost, Fraternity is essential to our Secular Franciscan call in that the fraternity is where we Secular Franciscans work out our salvation and the salvation of our sisters and brothers: "In these fraternities the brothers and sisters, led by the Spirit, strive for perfect charity in their own secular state" (Secular Franciscan Rule 2). The fraternity is "the basic unit of the whole Order and a visible sign of the Church, the community of love. This should be the privileged place for developing a sense of Church and the Franciscan vocation and for enlivening the apostolic life of its members" (Secular Franciscan Rule 22). "The vocation to the OFS is a vocation to live the Gospel in fraternal communion. For this purpose, the members of the OFS gather in ecclesial communities which are called fraternities" (General Constitutions Article 3.3). Second, from my vantage point, Fraternity continues to be "an endangered species" although this year has been better than last. According to our official numbers reported to the International Council of the Secular Franciscan Order (CIOFS), which are binding for our NAFRA budget for the next three years, the number of our active professed members AND the number of our Candidates have decreased again this past year as they have been doing pretty consistently in recent years. Yet I feel more hope this year than last because our number of fraternities actually increased, and the drop in both our active professed members and our Candidates was smaller than anticipated, thanks be to the Holy Spirit and to all our efforts, locally, regionally and nationally. By best guess, NAFRA, the Secular Franciscan Fraternity of the United States, has reported 12,739 active professed members to CIOFS. This is down 264 members from the 13,003 active, permanently professed members nationwide I reported in my 2013 Annual Report, which is over 200 less than our average decline of 468 members for the preceding six years, as reported in that 2013 Annual Report (http://www.nafra-sfo.org/NationalMinister/AnnualReport2013.html). We currently have 1014 Candidates, which is only down 42 Candidates from our 2013 numbers, which had seen a drop of 100 Candidates from 2012, by comparison. And this year we report 637 canonically established fraternities, which is up 31 fraternities from the 606 we reported in 2012, an increase of just over one canonically established fraternity per Region, and even our National Fraternity can report continued growth and stability in the St. Padre Pio emerging Fraternity in the United States Territory of Guam. Congratulations and thanks to all! Despite our being "an aging leadership of an aging Order," as I reported last year, I believe this past year we have done a slightly better job in answering the Holy Spirit's challenge to all of us to offer a spiritual reality, an ecclesial community, sufficiently vital to attract and keep new life, new membership, and new fraternities. I continue to shout from this 2014 Annual Report what I wrote in my 2011 Annual Report and spoke about in my 2012 Vision of our Order: "Perhaps no aspect of the Secular Franciscan life should be of more concern to those called to leadership than the vitality of the fraternity, be it local, regional, national or international" (http://www.nafra-sfo.org/meetings_and_resources.html). To date, 2014 has been a blessed year for Spiritual Assistance, at least to the National Fraternity. The first of the blessings must be both the quality and quantity of our Spiritual Assistants; for the moment, one from each of the "Institutes" responsible for the altius moderamen, referred to by Canon 303 of the Code of Canon Law (Article 1.4 of the General Constitutions; see also Secular Franciscan Rule 26). Speaking quite bluntly to all who will listen, the Secular Franciscan Order must maintain this "life-giving union with each other" (Secular Franciscan Rule 1) if we are to survive. In alphabetical order by last name, at the National level, we have Friar Bob Brady representing the Order of Friars Minor; Friar Stephen Gross representing the Order of Friars Minor Conventual; Friar Kevin Queally, President-in-turn, representing the Franciscan Friars of the Third Order Regular; and Friar Matthias Wesnofske representing the Order of Friars Minor Capuchin. Together they form the Conference of National Spiritual Assistants (CNSA) (http://www.nafra-sfo.org/cnsa.html), and together and individually they are to be thanked, consulted, respected and prayed for. Wise people will seek them out in person at our upcoming National Chapter! The second of the blessings for this year was the Summer Seminar focused on Spiritual Assistance and hosted by St. Francis University in Loretto, Pennsylvania. Four wonderful Secular Franciscan women balanced with three of the four Friars on the CNSA to create a strong two-track series of presentations for those with and those without much actual experience with Spiritual Assistance. These women in alphabetical order by last name were Cyl Maljan-Herbelin, OFS; Faye Martin, OFS; Anne Mulqueen, OFS; and Sylvia Paoli, OFS. Over 80 people were in attendance, including myself, and I congratulate all my sister and brother attendees and presenters. To me, it was a very valuable Summer Seminar, and I pray that there will be some reporting and follow-up at our National Chapter. My own follow-up from the Summer Seminar to our upcoming National Chapter to is repeat a challenge I gave to all the National, Regional and Local Servant-Leaders attending the Summer Seminar: Pope Francis has declared an upcoming Year of Consecrated Life, which will begin the weekend of Nov. 29-30, 2014, the first Sunday of Advent, and will end Feb. 2, 2016, the World Day of Consecrated life. PLEASE, would every Region, every local Fraternity plan an All-Franciscan Day, a joint gathering of the Franciscan Family, a Greccio or Transitus Service, something, where the Friars and the Sisters and us are all together and visible to the public? Please! Many Regions already do something along these lines. Please share what you do and how you do it with all of us! The third of the blessings this year was our first ever (at least for me) National Retreat. Each year every Secular Franciscan, if not every Fraternity, should undertake a spiritual retreat to turn away from the world for a long moment and turn to God. This year we gathered as a wonderful National Secular Franciscan family that also included 13 Regional Ministers or Vice Ministers and members of 20 Regions in attendance. Our Trinity of Retreat Planners, in alphabetical order by last name, Mary Bittner, Mary Frances Charsky and Jan Parker, together with our "National Registrar" for last year's Chapter, Claudia Kauzlarich, allowed sharing one-to-one, small group discussion and whole group sharing, all focused around our theme "Francis of Assisi and Francis of Buenos Aires: Seizing the Franciscan Moment in the Church today," which was presented in a deeply spiritual, but also in an entertaining and informative, manner by our Retreat Master, Brother Bill Short, OFM. Don't trust me! Permit me to share just three comments about the Retreat with you. Wrote Kate Kleinart, "What an absolutely great four days! There is nothing that was less than completely enjoyable. I have never been to Our Lady of the Snows before and really found it to be an ideal place to get away, get tuned in and tuned up. The room was very comfortable and the food at every meal was just great. The program was well planned with just the right mix of talks, round table discussions and a little fun thrown in. I have come away with many new friends and a deep appreciation for all your planning and work to make the weekend such a success! Brava!" Wrote Ray Richter, "There is no way that I can possibly describe how the retreat was so skillfully and lovingly presented to us by Brother Bill Short OFM. We also had small group discussions every day. On Saturday night there was a roundtable/social. We sang songs told jokes and stories and basked in the glow of the retreat. We prayed, we listened, we shared and we cared, we laughed, we cried, we grew." Susan Tabor added to Ray's comments: "I must echo your sentiments; what a wonderful experience it was for me! It was the first national function I attended, and I look forward to attending more of them. All of you were so generous in so many ways! I am honored to have you as my brothers and sisters! I think of you and pray for you often." The fourth of the blessings for this year is "the relatively new practice of holding a Spiritual Assistants' workshop at as many CNSA meetings as possible." (See the CNSA Annual Report to NAFRA 2014). I pray that these workshops may continue. I also look forward to a joint meeting of the CNSA and the NEC in January 2015. Such a meeting has been sought and not achieved for some time. Further, I congratulate all Regions that are conducting Spiritual Assistance Training Sessions. By our Secular Franciscan Rule 26, Fraternity Councils at every level "shall ask for suitable and well-prepared religious for spiritual assistance." Let us all pray that "the provincial ministers and the other major superiors, in the area of their own jurisdiction, guarantee (my underlining) the spiritual assistance to the local fraternities entrusted to the jurisdiction. . . .(and) see to it that their own religious are interested in the OFS and that capable and well-prepared persons are appointed for the service of spiritual assistance" (General Constitutions Article 88.1). As Secular Franciscans, we all share a supernatural call, and thus the essential element of vital Secular Franciscan fraternities remains the spiritual. Vital Secular Franciscan fraternities also need essential information, effective lifelong formation and spiritual, even social and organizational, transformation. This year has been and will continue to be a year of transition and, prayerfully, transformation. The NEC has chosen former Regional Minister and current member of the National Formation Commission (NFC) Mary Anne Lenzi to follow our National Formation Commission Chair Bob "Fitz" Fitzsimmons, as he has recommended. I pray that both Mary Anne and Fitz will be in attendance at our National Chapter, and I believe that both will make Formation Presentations. I very much look forward to what they have to say. Mary Anne is very much involved with the planning for the "Mile High Q" in Denver in 2016, and she has told the NEC that she wants this Q in particular, as well as Formation in general, to be more "relational" and "interactive." In her application for Chair of the National Formation Commission, Mary Anne wrote, "I envision the NFC as a collaboration (recognition and appreciation) of each member's ideas, talents, GIFTS. Our FUN Manual, so ably written by the previous commission, has solidified the information necessary for good formation. Now, the commission must continue the mission, always inviting our members to be open to the Spirit, who transforms. That is, we must move forward with swift pace, light step and unswerving feet, (St. Clare to St. Agnes of Prague) using all the materials at our disposal to develop the Franciscan person and our Franciscan conscience. This will enable us, in our own time, to effectively carry out the Gospel message to which the spirit of our Seraphic Father calls us through our Rule" (all italics and capitalization as in her text). Welcome, Mary Anne! 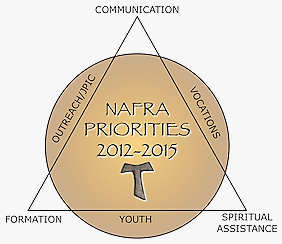 The all-important base of our Triangle of Priorities diagrammed above is Youth, and as with Formation, we pray that 2014 will be a year of transition and transformation. In 2012 we did not have a youthful Youth Chair. For 2013 and some of 2014, we had Dr. Rob Breen. Unfortunately, Rob did not stay with us very long at last year's National Chapter, nor has he remained with us very long this year. He had to resign and left us without any recommendation for a substitute. Fortunately, your NEC has been able to secure the first Mother and Daughter Team in NAFRA history to help move us forward with Youth and Young Adults. Former Regional Minister Sue Nelson and her daughter Christy Nelson, currently a Regional Vice Minister, will, I believe, present AND stay with us at this year's National Chapter much longer than Rob did last year. I was very impressed with their ideas and input at both the special meeting about Youth and Young Adults held at the 2012 Q in Chicago and at the first-ever Confab at Our Lady of the Snows in 2013. Their outreach to Youth and Young Adults in their own Franciscans of the Prairie Region has also been significant. I recommend their presentation to you at this year's National Chapter and encourage you to share with them your ideas and plans for Youth and Young Adults in your fraternities and Regions. Welcome, Sue and Christy! Coming up the left side of our diagrammed Triangle of Priorities above, we have Outreach/JPIC. Permit me to start with JPIC. Our JPIC Chair Carolyn Townes has made her first year on the job one of Prayer and Education, both of which I, for one, commend. She has just initiated 12 Weeks of Franciscan Peace beginning with the Transitus on October 3 and going to Christmas. Prayer is first and foremost in our lives as followers of Jesus. Everything we do and say must be embodied in a spirit of prayer." Yes, indeed. Thank you, Carolyn. And I always look forward to her presentations. Don't miss her at this year's National Chapter! Also at this year's National Chapter, we should hear from the 2014 JPIC Award recipient, the Most Rev. Gerald F. Kicanas, D.D., Bishop of Tucson, Arizona. Bishop Kicanas was nominated by the St. Thomas More Region, and his nomination reads in part: "Over the last decade, southern Arizona has been 'ground zero' for the humanitarian crisis of desperate migrants risking their lives, by crossing the desert on foot. Each year, 150-200 human remains are found in the desert around Tucson. Many more hundreds are found each year along the Mexican border in Texas, New Mexico and California. "Bishop Kicanas has been tirelessly working to create bridges of love and concern in an era of wall building and militarization. He helped form the "Dioceses Without Borders" project, which unites the Catholic Dioceses of Phoenix, Tucson and Hermosillo, Sonora, Mexico, to work together on migration issues. He reaches out to all the human beings in the borderlands: the humanitarian groups; the Border Patrol and other enforcement agencies; the migrants; the faith community; the ranchers and elected officials. He welcomed the Jesuit's Kino Border Initiative project in Nogales. Bishop Kicanas' commitment has also played an important role nationally, testifying before Congress, for the need for comprehensive immigration reform. "Because of Bishop Kicanas' steadfast commitment over the last decade to speak out in defense of human dignity, in the midst of a sometime hostile environment, we nominate him for the Franciscan Peace Award. He exemplifies the Franciscan values of peacemaking, charity and justice for the poor. "Bishop Kicanas was born in Chicago on August 18, 1941, son of Frederick and Eva Kicanas. He was ordained a priest on April 27, 1967. Appointed Auxiliary Bishop of Chicago on May 20, 1995, where he had pastoral responsibility for Archdiocese northern tip including Lake County and the northwest suburban Cook County. He was appointed Coadjutor Bishop on October 30, 2001 by Pope John Paul II and became the Bishop of Tucson on March 7, 2003. "Bishop Kicanas is the Chairman of the Board of Directors of Catholic Relief Services. In June, 2013, he visited Lebanon to visit refugees from Syria and to visit with relief workers to assess and make recommendations for further assistance. He was a member of the Board of Directors of the National Pastoral Life Center and a former member of the Catholic Legal Immigration Network (Clinic). "He is the former Vice President of the U. S. Conference of Catholic Bishops and has served as Secretary for the Conference. He has Chaired both the Communications and Diaconate Committees and on the Subcommittee for Lay Ecclesial Ministry. He has been a member of the Communications, Migration, Laity, Liturgy, Priestly Formation and Doctrine Committees as well as the National Advisory Council. "He was the recipient of the Joseph Bernardino award in 2008 and received an honorary Doctorate in Humanities from Lewis University in 2010. His Episcopal motto is 'Justica Promueve La Paz' meaning 'Justice Begets Peace'." It will be an honor to present the 2014 Justice, Peace and Integrity of Creation Award to Bishop Kicanas. Finally, under Outreach, you may remember that our brother Jim Flickinger presented at NAFRA 2013 his plan for an OFS Disaster Relief Team, which would not try to duplicate, but only assist in the Relief efforts of Catholic Charities. Jim has gone ahead and started to gather an initial relief team in the Five Franciscan Martyrs Region, writing to Secular Franciscans there: "We have all seen the devastation that hurricanes cause in our beautiful state. Not only are homes and buildings destroyed, but families are left in turmoil. "Our aid will be multi-faceted. Initially, Secular Franciscans will be prepared to handle the needs of infants and small children (providing diapers, pacifiers, nutrition, etc.). But assistance will not be limited to helping with these needs. We will also be available to work in other capacities depending upon the skills of our volunteers (e.g., office, construction, medical, counseling, etc.). "We are also uniting to pray for the victims of these tragedies and to pray for the Secular Franciscans who are serving as active volunteers providing disaster relief." I applaud this first step in trying to be more visible and active (and joyful) in our outreach to our sister and brother Americans in a time of unfortunate disaster. I believe Jim plans to be at this year's National Chapter to report on how things are going. Thanks and Welcome, Jim! At the top of our Priorities Triangle above is Communication, which focuses and hinges, if you will, all that Secular Franciscans share in and among the four Fraternities in which each of us are members: our Local, Regional, National and International Fraternities. As we began last year, the National Communications Committee will have its one yearly meeting on Tuesday Oct 21 at 1 pm prior to the beginning of our National Chapter. Anyone attending Chapter is invited to attend this meeting as well. If you attend, please bring your ideas concerning the Committee's stated purpose: "The Communications Committee will examine the current avenues of communication that exist in the Secular Franciscan Order of the USA, evaluate how well these avenues are working, and then set goals for improvement and/ or additional means of communication if necessary. These avenues of communication would include: between and within all levels of the Order, both from the higher levels to the individual members AND from the individual members to the governing bodies. (Also,) between the Order and the Church and the world." I, too, will attend this meeting of the Communications Committee because I struggle to maintain adequate communication with and among the Fraternities I belong to. I also struggle with how much we as a National Fraternity should be using current social media tools and at what expense in time and treasure? I need your ideas. Once again, I commend Jim Wesley, the editor of our TAU-USA, and all his creative staff; the NAFRA Public Relations Committee with Bob and Mary Stronach; the NAFRA Computer Committee with its Chair Dan Mulholland; and National Webmaster Vickie Klick for their consistent and admirable efforts to further effective communication with and among our 30 Regions, 637 Fraternities and 12,739 active, permanently professed Secular Franciscans, and I hope soon, if NAFRA agrees, to all of our 1014 Candidates. Every recent (from 2004 to 2013) issue of our TAU-USA publication is available through our National Website: http://www.nafra-sfo.org/tau-usa.html. In addition, email, both personal (tbellosfo@gmail.com), and through the NAFRA-L, NAFRA-ALUM and NAFRA-RM listservs, keeps me in contact with our widespread National family. Thanks to Dan Mulholland for keeping these listservs up and running. "During the time allotted for the Vocations Committee at the NAFRA gathering we will brainstorm with Regional Ministers to discuss 'best practices' regarding vocation promotion. With the brainstorm of 'best practices,' the Vocations Committee will present a plan for a year-long Vocations Campaign for 2015. Focus will be on offering ideas/templates/materials and challenges to empower and inspire regions/local fraternities to do conduct outreach activities. Tracking number of events. Asking Regions to keep track of how many discussions, announcements, open houses were held. Reporting back to National on accomplishments and outcomes." 2014 has been an active year for our Ecumenical/Interfaith Committee under excellent leadership from Anne Mulqueen, for our Archivist Sharon Deveaux, for our already-mentioned Public Relations Committee, and for our Computer Committee especially here for their continuing work on maintaining the never-ending database. Thanks to all of you for all your hard work. Membership and Participation in our four Fraternities. By our Permanent Professions, each of us becomes members of four Fraternities, our Local, Regional, National and International Fraternities. I encourage each Secular Franciscan reading these words to find out more about and participate more often with each of these Fraternities. I once heard a member of the National Fraternity say how much more he got out of his National Fraternity than he got out of his Local Fraternity, and how little time he spent at his Local Fraternity. That is a mistake. The National Fraternity cannot stand without the Local Fraternities; we only get new members from our Local Fraternities, and the Local Fraternity is where all of us began our Franciscan Journey, and we must not forget where we came from! Similarly, few of us know very much about our International Fraternity. For myself, I have never attended a single International Gathering since professing on June 12, 1983. With God and the airlines willing, this absence will change this November. According to the Minutes for the NEC meeting in July, 2014, Second Draft, lines 259-260: "Mary Stronach asked the NEC for nominations for the International Council. All agreed to nominate Anne Mulqueen and Tom Bello." I have been accepted as an official Observer at the International Election Chapter to be held November 1 to 8, 2014 in Assisi, and I plan to attend (on my own dime). Please pray for your International and all of our Fraternities. Prayer is where we started and where I will finish this already overlong Annual Report. Just last night, I prayed and sang and joined in a candle-light procession with all our beautiful Franciscan family, Friars, Sisters and us, at the Transitus Service held at the brightly lit Franciscan Monastery perched atop Quincy Street in Washington, DC. The homilist, Friar Jude DeAngelo, OFM Conv, said words to the effect that despite the horrific beheadings, despite the onslaught of the Ebola epidemic, despite our own sins and failings, each one of us, by our Christian and Franciscan call, has been commissioned by God to bring Joy and Peace to our darkened and troubled world. Let us always pray for one another that we might all "Be the Merciful Presence of God!"